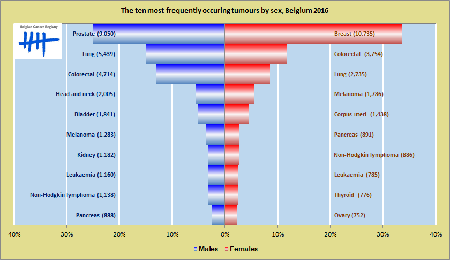 The Belgian Cancer Registry regularly publishes figures related to cancer incidence, mortality and survival rates. The latest details are always available for consultation on the website. Are you looking for a complete overview of the most recent figures? 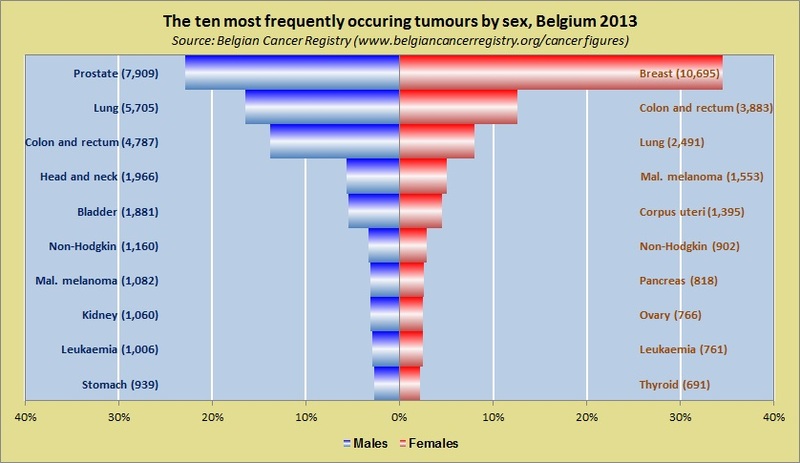 The Belgian Cancer Registry bundles this information in a report that you can download here. You can consult the annual figures in table form. The tables contain the incidence figures per tumour localisation and gender. Separate tables are available for Belgium, the Flemish Region, the Walloon Region and the Brussels-Capital Region. If you would like information about a specific type of tumour you can use our handy tool. After selecting the type of tumour, the region, incidence year and gender you are interested in, you can consult the related diagram. The applicable figures can also be downloaded in Excel format. If you still cannot find what you are looking for, contact the Cancer Registry for more specific tables and graphs. We can supply additional and more specific data related, for example, to primary tumour localisation, the tumour stage and the histological diagnosis. Take into account that we will not be able to supply certain information immediately because its collation requires time and must be scheduled in between the Cancer's Registry's other activities. Naturally we do our best to respond to your request and supply the data as promptly as possible. Data related to smaller geographic regions or data at record level are also available from the Cancer Registry. We adopt strict norms and procedures when evaluating such specific requests. The conditions and documents necessary for such requests can be consulted here. In 2016, 68.216 new diagnoses of cancer were registered (excluding non-melanoma skin cancer). The disease affects approximately one in three men and one in four women before they reach the age of 75. Cancer mainly affects older people. Respectively 67% of women and 78% of men are aged 60 years or older when diagnosed. 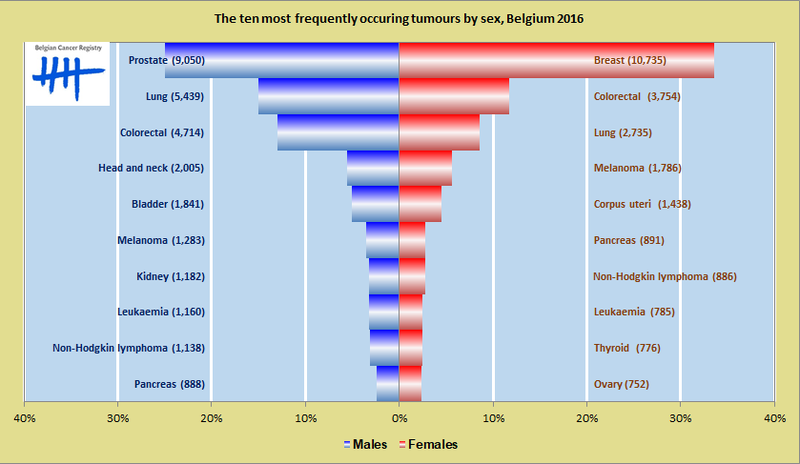 Overview of the ten most common cancers per gender in Belgium in 2016. Click to enlarge.